Almost every worship CD– including ours– begins with the roar of a crowd. I have yet to see a worship DVD filmed in front of a handful of people. The more time you spend with worship CDs and DVDs, the more you subconsciously believe that a worship service is about the euphoria of a crowd, the adrenaline rush of taking the stage. More people aspire to be worship leaders now because of what a cool profession it has become. It's sickening to sit with young worship leaders and watch a U2 or Coldplay DVD and see their eyes light up as mine once did as they think of ways to incorporate those elements at their church. Why wouldn't they? There is little difference between today's worship services and rock band show. But still, time in front of large crowds can make you do funny things. I've sprayed water from a bottle onto "worshippers" on the front row, I've crowd surfed in a packed room, and kicked beach balls from the stage. All in the name of having fun in church. None of these things are hideously evil, but they are deceptively destructive. They destroy the sacredness of the priestly vocation– and the worship leader is priest before he is anything else. The worship leader is not a priest who mediates on behalf of the people; he is a priest who stands among a congregation of priests, calling attention to God. He is, as a priest is, one of the people. He shares their bloodline, their heritage, their history. He knows their stories. Today's worship leader is trained to be a performer working the crowd, instead of a priest lovingly standing among the people of God. Thanks for posting this, it really is amazing at how quickly we can become consumed with any of our positions and want to be elevated to ‘rock star’ status. The lessons you’ve learned aren’t only for worship leaders, but apply to all of us in our walks of life. Thanks for being transparent and honest about your own walk. Wow. Awesome. You should write this as a book, Secondhand Worship Leading. Great Post. It really helps me being in my first year of vocational worship ministry. So technically I’m “Glenn circa 1999”. Thanks again. What is funny in my eyes is that even in the midst of all that, God still used it. New Life is the church it is today in part because of it’s whole hearted desire to be people of Worship. It is inveterate in the church D.N.A. Good words and I think it can be wrapped up in two words… STAY HUMBLE… and you can do that by Staying in the word and Staying Accountable. I love this. I often want to remind the congregation that just because we are in this crowd does not mean we have worshiped God. Perhaps we have only been witness to others worshiping God. That is the danger of the “worship concert”. Yet, thankfully, God works in our mixture and helps us grow into a more mature understanding of our personal responsibility in true worship that the Father seeks. And it is good that even the “worship concert” provides portals for new worshipers to taste the divine. You make great points Glenn. I agree 100%. I struggled with those issues so much that when my family and I started attending New Life several years ago I took the opportunity to lay down my music ministry and I didn’t pursue working with the worship team, like I had always done at the 2 previous churches that I had attended. I felt lead to lay the gift down before the One who gave it to me until such a time as He sees fit for me to take it up again. When the doing or the gift becomes our focus then we need to refocus. This is exactly what I needed to hear as a new full-time worship pastor. That’s good word. I’m not a worship leader exactly, we have a very different type of worship where I’m involved, it’s all prophetic and spontaneous and shared, no stage , we are actually in the back of the room…it’s just different. Growing up my dad was a minister of music and I sang and played instruments and did the show. Not for me. I really appreciated your post, as I do more leading, I am most concerned about the purity of what is happening and who’s being glorified than anything else. And pray for freedome with reverence. Loved this post. And I love the title “vapor of influence” as reality check for all seeking the lime light on stage. Having shared a couple of these experiences in life, I definitely concur on your reflections! Truth is, great musicians & fantastic music are a dime a dozen. (I also saw that when traveling.) But the stuff that is ETERNAL and truly LIFE CHANGING for people is what a worship leader really needs to grab hold of. Here’s a couple of more facts to tag onto the celebrity/stage experience of a worship leader: 1) An excited, happy crowd that is “responding ” is not necessarily worshiping. Or at least, not necessarily worshiping God. (ouch!) Worshiping an experience? Worshiping the leader’s ability to worship? take your pick. 2) when someone pays a compliment, “Great job! That song was awesome.” or “You did a fantastic job leading us today” doesn’t (necessarily) mean you led them to God. In fact, musical compliments, or compliments directed at me, rarely hold much meaning to me anymore. What makes me smile? When someone says, “I met with Jesus during the worship.” or “I feel the purity of God in your worship” or “Thanks for taking us into His holy presence. He spoke to me.” These comments are a reflection that people got past “ME” and arrived at an encounter with God – and proves that I did my job as a worship leader. And the fact that they were comfortable not paying ME the compliment, but rather gave God glory somehow while sharing with me is also another great indicator that I did my job! As I was praying today, praying for the conference, etc. I heard God speak to me, “Nothing takes the place of personal revelation.” No matter how much we are inspired by the words, the actions, the writings, etc. of others, we are no less changed until it somehow becomes personally revealed to us. While we MUST be faithful in providing avenues for people to discover God in these ways, ultimately, the highest calling is to facilitate environments where they can EXPERIENCE God Himself and have these personal revelations change them. Worship leaders have the greatest opportunity to DO just this. Well said Glenn. I consider it an honor to call you my friend. Much love. This blog article was so good. I attended NLC for 5 years before my husband had to move with his work. For the last year I have struggled with every church we have gone too-especially comparing everything to NLC and especially the Desperation Band! I liked reading your article because this attitude not only affects the worship leader but the audience as well. I think I will have a new perspective on worship music after reading your words. However I will always be eternally thankful for the music you guys produce as it has brought me into the presence of the Lord so many times. Keep up the good work! This is equally applicable to those of us who speak in front of the congregation as well! This is great information to young leaders (not unlike myself). I can tell you are at an awesome (and covetous) place in your relationship with God! I think you have hit the nail right on the head, not only for worship leaders, but also for anyone who is serving God in any kind of public forum. As a dance director and choreographer, I run into these crossroads in myself frequently. As much as dance is my worship to God, it can also present temptations. Letting God lead those who observe, and focusing myself on serving God, goes a long way in staying out of the traps that come with it. I’m glad to call you friend. I needed to read this. I’ve been thrilled and frustrated all at once with worship at Boulder Street. I get too excited when it goes well, and too down on myself when it doesn’t. Thanks for the reminder that our responsibility is simply to point to God and let Him do the rest. I love how you think, Glenn. It is so refreshing that you communicate your story and how worship has been continuously reformed and rediscovered throughout it. There is something redemptive about the act of worship; it doesn’t mold us just in individual experience, but through our cumulative history story of worship we begin to put together the narrative of its meaning. Learning to continuously merge the horizon of our story with the story of Scripture edges us closer to the redemptive power of worship. Needs to be done for the glory of God. Applause is a distraction, which is something I knew as a choir member. I am an eighty year old woman. I was 45 in 1980. I loved the praise and worship of that era. I had grown up in a traditional church, singing traditional songs which I love but I never felt moved to do more than sing. The praise and worship I was introduced to came from Scripture and it caused me to want to worship God. The first few praise songs (This is the day that the Lord has made. etc.) 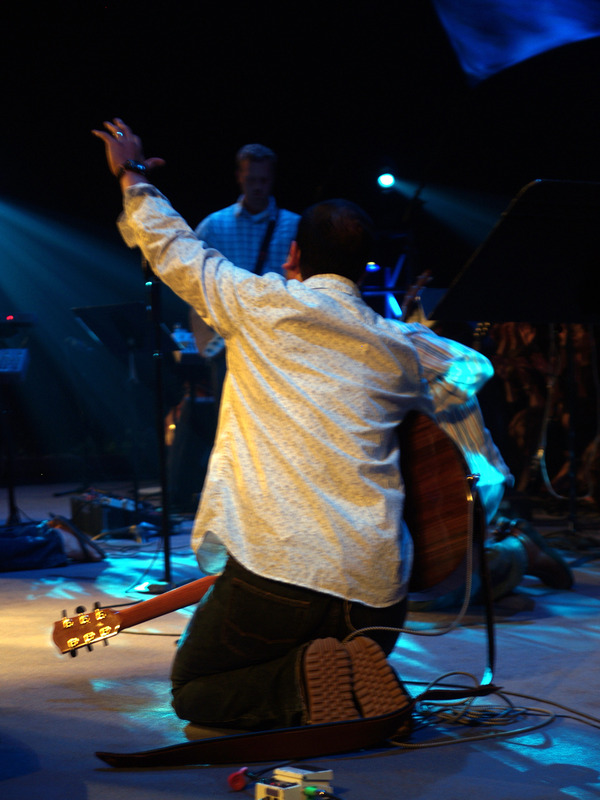 gradually carried us from the cares of the world into the courts of praise and then we entered the gates with worship. (As the deer panted for the Water, etc.) We all sang, praised and worshipped God. The worship leader was just a man from our church but he knew how to lead us into looking at Jesus instead of him. Oh to be in a worship service like that again!! May God help you be that man!